Whether you're in Australia, England, or America; blue-collared, white, or pink, we've all got 24 hours to work with. Success comes down to what we're able to do in those hours. While every entrepreneur would love to keep the sun from setting and adding hours to their day, there are strategies that will help maximize work habits and productivity. "If you wait until the last minute, it only takes a minute to do" -- Cyril Northcote Parkinson. We've all experienced this law in action struggling for a month to finish a project, then magically getting it done in the final week. Or the house is a mess for weeks, then spotless within a few hours of the in-laws showing up. The law provides great leverage for efficiency: imposing shorter deadlines for a task, or scheduling an earlier meeting. 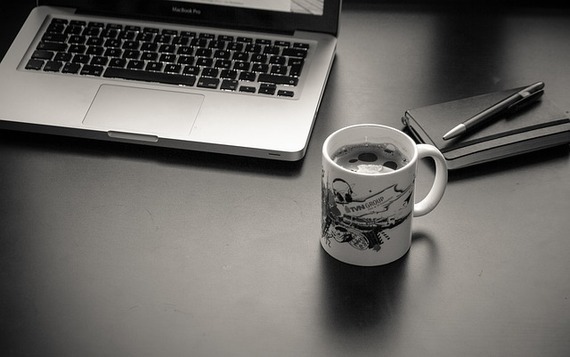 Find the sweet spot for productive hustle -- rushed work can be a recipe for reckless work. For athletes, it's called being "in the zone" -- when you're so focused that you're numbed out to any distractions. It's a state we can all tap into: writers, musicians, and entrepreneurs. 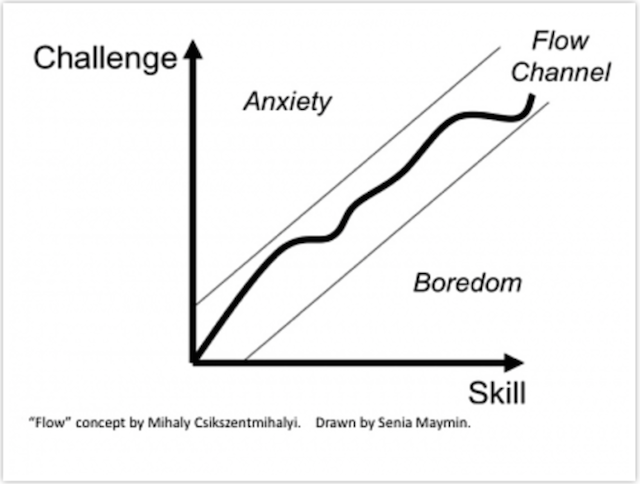 It's finding that balance between challenge and skill. 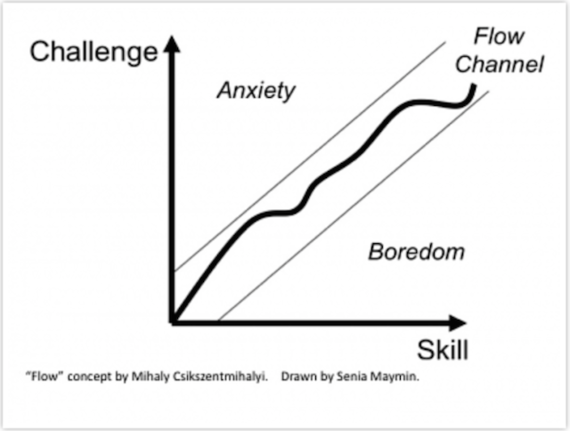 If the task is too challenging and beyond our skill, then we go into anxiety and frustration -- not challenging enough, and we fall into boredom. Stretch yourself, but don't snap. We're at our most efficient when in the zone. There's many compelling cases against multi-tasking -- even folks walking and talking on a cell phone ran into people more often. And to add humor to the study, many failed to notice the clown riding a unicycle. Telling an entrepreneur not to multi-task however, is like telling a pig to stay out of mud. The truth is, nobody multi-tasks -- the misnomer better termed "task-switching," we jump-around rather than juggle. The problem is ending up with too many open projects, and spreading yourself too thin. A good quote on scaling back is by Alexander Graham Bell: "Concentrate all your thoughts upon the work at hand, the sun's rays do not burn until brought to a focus." From David Allen's Getting Things Done, he explains that the most productive people capitalize on the little windows of time opening up during the day. Having an inventory of two-minute tasks on hand whenever windows appear will increase productivity; cleaning out the inbox, checking voicemail, approving a request, builds our efficiency muscles and gets the ball rolling for bigger tasks. A major cause of procrastination lies in overthinking the next step, Allen says it takes less time to do the action than the time spent thinking about it. Nerve cells in our brains control our circadian rhythms, which influences sleep-wake cycles, hormone release, emotions and energy levels. Constant operation outside circadian rhythms (e.g., international pilots) creates fatigue. Efficiency lies in synchronizing specific work with these biological peak times. Dr. Steve Kay says analytical work is best within a couple hours of waking -- the morning rise in body temperature increases blood flow to the brain. Alertness slumps after lunch as the digestive process saps energy. This analytical disengagement is the best time for novel and creative thinking according to Professor Mareike Wieth. Exercise increases efficiency. Dr Gerard Kennedy notes more Olympic records are broken in the late afternoon than any other time. Muscle strength, lung capacity, eye-hand coordination and joint flexibility peaks between 4 p.m. and 6 p.m.
• I won't power is to resist temptation -- saying "no" to social media. • I will power is to choose an alternate behavior -- send a social, but networking email. • I want power is remembering your why, your end goal -- expanding your career, business, profits. Willpower is like a muscle; when we fail to reach goals, it's due to solely relying on I won't power -- and we can only say "no" so many times before we crumble. However, bringing in backup, and using all three aspects of willpower will triple the likelihood of success. Resist, replace and remember. The entrepreneurial hustle makes breaks non-existent. Not only are employees skipping lunch, but feeling guilty for taking short breaks, despite clear cognitive benefits for our fatigued brains. So what's the perfect work/rest ratio? DeskTime App played big brother, monitoring employees' computer use -- they found the most productive 10 percent worked hard for 52 minutes, then took a break for 17. Indeed our brain's natural rhythms of attention means we can focus for up to 90 minutes, then need roughly 20 minutes rest. Strategic breaks equals efficient work. It'd be preposterous to think simply changing your posture affects productivity -- if it weren't true. 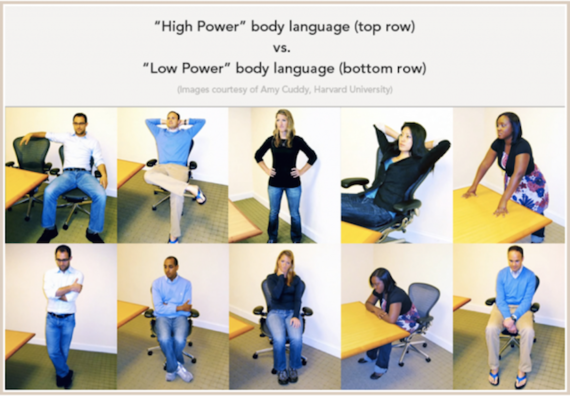 Professor Amy Cuddy's Ted Talk highlights the psychosomatic and neurological responses caused by our posture. 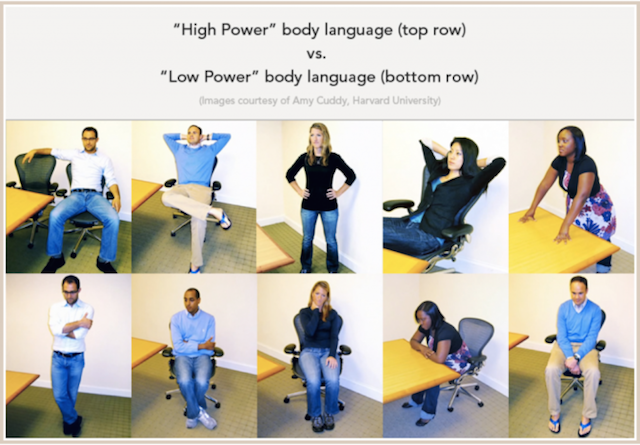 Taking a high-power pose causes an increase in testosterone (confidence, assertiveness, energy) and a decrease in cortisol (stress, anxiety, nervousness). A confident, testosterone-perked person is much more productive than a cortisol-crippled stressed person. Our brain is wired to respond to certain physiologies -- a forced smile will still release endorphins. Pulling yourself out of a figurative slump is as simple as pulling yourself out of a physical slump. Along the same stream of the Sharpe ratio's risk/return measures in finance, and the "minimum viable product" in the tech world, the strategy is about being calculated and conscious in our efforts -- with a flexible, rather than fixed process and goal. It's being productive and ready to pivot, rather than simply charging full-steam ahead. Case-in-point: Nick Swinmurn's startup of Zappos. He validated his idea without blowing cash by first going to a shoe store, taking photos and posting them online. Then when sales came in, he went and bought the shoes. He didn't need to pivot, just preserver.